CHICAGO — Since we have to wait until spring to hear from Rahm Emanuel’s task force on police accountability, let me offer an example of why the mayor should immediately open the books on police misconduct claims that are no longer under investigation. Recently ousted police Supt. Garry McCarthy said in a 2013 interview that his policy is “termination” for cops who get caught lying during an official investigation. But as things turn out, that’s hardly the case in our town. DNAinfo Chicago found that IPRA recommended firing only 55 percent of officers found guilty of violating Rule 14. And none of those officers were fired for making false reports. For the most part, it's impossible to find the names of officers who get accused of violating Rule 14 unless the allegations are upheld by IPRA. The Fraternal Order Of Police union contract prohibits the city and IPRA from naming officers accused of misconduct unless the allegations are proven true or the officer requests that they be made public. But since then, Invisible Institute, a South Side data journalism project, filed a lawsuit that forced IPRA to release documents that named officers in misconduct cases that were not proven. A search of data that Invisible Institute recently posted online showed 14 police officers included in the DNAinfo Chicago special report had collectively racked up 107 misconduct complaints between 2002 and 2008 and 2011 and 2015. In 2013, DNAinfo Chicago used a list that named officers investigated by IPRA who were accused of violating Rule 14 to show how the department’s disciplinary process (IPRA recommends punishments, and then the police superintendent files charges with the police board, which makes the final decisions) doesn’t dole out consistent punishment to send a message to the rank and file that lying won't be tolerated. The four-part series offered details of complaints against 14 officers — including a lieutenant and two sergeants — who IPRA found filed false reports or lied during investigations. None of those officers was fired. One Rule 14 violator, Sgt. Thomas O'Grady, who faced misconduct complaints in 2007 for beating a handcuffed man, calling him a racial slur and lying to cover it up, became a repeat offender before the allegations were sustained in December 2009. In September 2009, O'Grady was accused of brutality and Rule 14 violations for allegedly punching a CTA bus driver while off duty and lying in an attempt to cover up the beating, which was captured on video. The investigation into 2007 brutality and Rule 14 allegations against O'Grady for beating the handcuffed man took more than two years before the charges were proven, a delay that experts will tell you makes it hard to prove misconduct cases. In O'Grady's case, the slow process might have saved him from getting fired. A month before O'Grady was set to face a police board termination hearing in 2010, the sergeant retired and former police Supt. Jody Weis dropped the charges because O'Grady was "already gone." At that time, it was impossible to tell how many other misconduct allegations those officers faced. But the newly released data from Invisible Institute shows that some officers in our 2013 series faced a long history of complaints. * Sgt. O'Grady faced 15 misconduct cases; three of them were sustained, according to Invisible Institute records available online. * Officer Daniel Gomez, who IPRA found lied to cover up misconduct during a December 2011 raid of an alleged drug dealer’s apartment, faced at least 20 misconduct complaints, including six allegations of illegal searches, five for unlawful use of force, three false arrests, two violations of police personnel rules and a verbal abuse allegation, according to data obtained by Invisible Institute. * Lt. Anthony Ceja, a 30-year police veteran with 74 department honors at the time IPRA recommended his firing for lying to investigators about the accidental discharge of pepper spray at a River North steakhouse, faced 15 misconduct allegations, including seven for unlawful use of force, according to Invisible Institute data. In the days before video was released showing officer Jason Van Dyke firing 16 shots and killing 17-year old Laquan McDonald, data obtained by Invisible Institute showed that Van Dyke, who is out on bond after being charged with first-degree murder, faced 18 misconduct complaints. Facing intense public pressure, Emanuel announced Tuesday that part of what he has asked his task force on police accountability to do is come up with a system to flag officers with a history of multiple misconduct complaints. 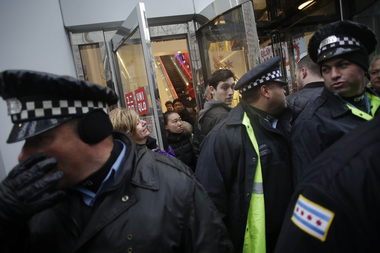 The answer is simple, Mr. Mayor — open the books on Chicago police misconduct complaints. Follow the lead of states including Alabama, Connecticut, Florida, Minnesota, North Dakota, Ohio and Washington, that make all police disciplinary records public. Let Chicagoans see for themselves which officers get accused of misconduct the most, and most importantly, send a message to the Police Department’s rank-and-file that the whole city is watching. Only sunlight can expose the dark corners in the busted police disciplinary process where corrupt officers — a collection of dirty cops who cover for themselves with lies they rarely get punished for telling — have been allowed to hide for too long. What's Worse: Sox Park's New Corporate Name Or Cubs' World Series Drought? Mayor And Top Cop Are OK With Sparing 1 Officer From Termination, Are You? Why Is Mayor Hiding Behind Top Cop Over Firing Officers In Laquan Case?